After a nearly 40-year wait, Taro Tsujimoto finally has a rookie card to call his own. The fictitious player came into being during the 1974 NHL Draft as an actual 11th-round pick of the Buffalo Sabres. The team's GM at the time was Punch Imlach and he had become annoyed by the arduous process of all picks being chosen by phone calls. This was the method used by the NHL to keep picks secret from the competing World Hockey Association (WHA). Imlach decided to rebel against the process by creating a Japanese player and choosing him with the 183rd-overall pick. Tsujimoto was said to have been a center for the Tokyo Katanas of the Japanese Hockey League. 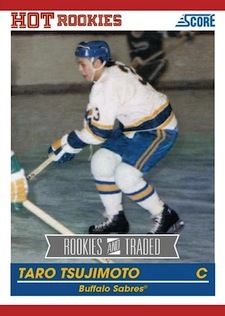 No such team existed and once the news broke about the made-up player, the myth of Tsujimoto took on a life of its own and became a common inside-joke for the Sabres team and fans. The card will be released in the 2010-11 Score Rookies & Traded box set as a short print. One in twenty boxes will contain the elusive player's rookie card. Randomly inserted gold parallels, numbered to 25, will also be inserted. The next question is which player is actually shown on the rookie card? Panini has declined to comment and this should further help to build the legend of the rookie whose arrival has been awaited since 1974.